Reclaiming public spaces, one bike-ride at a time - sister-hood magazine. A Fuuse production by Deeyah Khan. 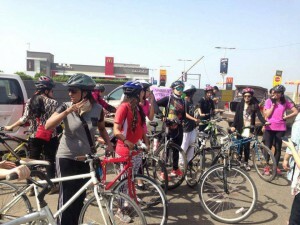 A group of over fifty girls rode onto one of the busiest main roads in Lahore. Passersby that Sunday morning openly stared at the unusual sight of women of all ages and backgrounds, riding bicycles on the main roads of Pakistan. Some young boys on motorcycles slowed down and openly laughed at the ‘absurd’ sight. Families in cars respectfully slowed down and veered their cars to the right to let us pass safely. I vividly recall a family of four on a motorbike change direction and drive parallel to us. They took out their cellphone cameras and made videos of us zooming by. I responded yes to the latter; we were going cycling in a group and our numbers would be our security. 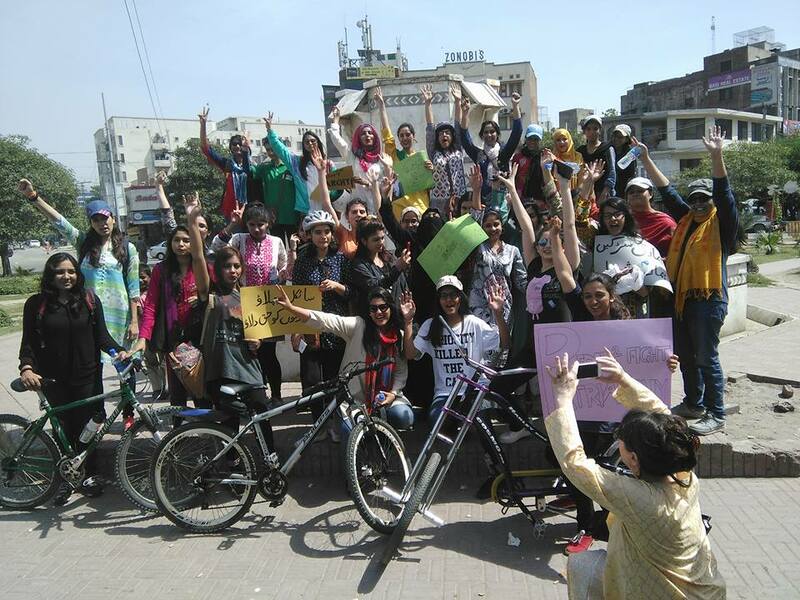 A couple of weeks prior to the rally, a woman named Aneeqa had been harassed by a group of boys while on her bicycle, till she fell down and injured herself. Aneeqa got right back on and continued cycling in spite of the bumps and bruises. 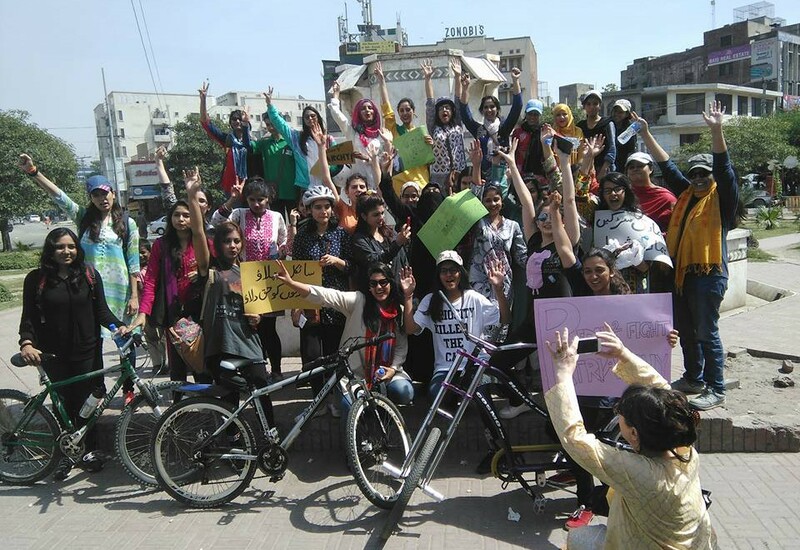 We at Girls at Dhabas decided to hold a bicycle rally to support of Aneeqa in line with our ongoing objectives to reclaim public spaces for women through a very basic approach: visibility. Truth be told, we all felt safer cycling in a group. 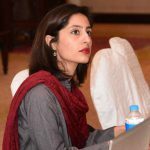 Some, myself included, had not been on a bicycle since I was twelve years old, as it became less socially acceptable for girls to cycle in public in Pakistan after puberty. Even in the more liberal and cosmopolitan cities of Lahore and Karachi, women are rarely seen steering cycles or motorcycles. Instead they ride perched behind men sitting sideways. God forbid their legs are open! The bicycle rally began at 10 am sharp on a Sunday, when half the city is asleep and the traffic is low. Till I actually began peddling I was unsure about whether I wanted to go ahead with this at all. I didn’t want to be stared at or catcalled. I didn’t want to topple over (having not cycled for over a decade) and ruin it for all the women cycling on that day. The moment I pushed the pedal a motorcyclist accidentally bumped into me, and I hobbled for a few seconds till I regained my balance, and thankfully, did not topple over. I had not felt this exhilarated since I was 12 years old. I told myself to look ahead. I told myself not to fall over. I felt a little more secure behind my dupatta. For the initial three miles I cycled cautiously behind the other women, but for the final kilometer I pushed the pedal and tried to overtake the cyclists ahead. 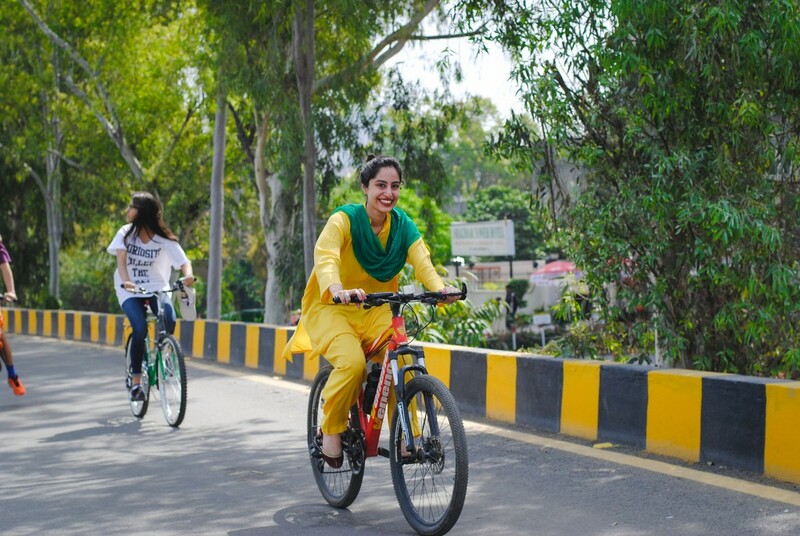 The feeling that came with riding a bicycle on a beautiful Sunday morning in Lahore overcame me, and nothing, not even the bemused onlookers, could make me feel self-conscious. I reached the final point feeling delighted and wonderfully alive. The cyclists then gathered at the meeting point where we shared our experiences of cycling in public. We agreed that it had been a task in itself distract ourselves from the stares we had received on the road. I conceded that even my head turns because I cannot help but notice women, when they are in public spaces traditionally ruled by men. Girls at Dhabas tried to change the visual landscape that day, simply making ourselves visible through the bicycle rally. On such occasions, we sit in parks, loiter on street corners or take our bicycles out for a ride. The bicycle rally was a platform that aimed to encourage female cyclists to feel comfortable about cycling in a public space because we believe no one should have to think twice about their right to be on the streets. It is hard not to feel paranoid. Often we hear from relatives and concerned friends of the story of someone they know, whose cousin’s wife’s friend’s daughter was harassed on the roads and therefore we must protect ourselves by laying low in public. After all it could happen to anyone of us. We plan our lives, our daily commutes around that fear. While the danger is real on the streets for women, it is so important to start actively being present in public spaces. Engage with public spaces, interact with those present and you will become less alien, less comical. And maybe, slowly but surely, the streets may also become less alien for us. Mehrbano Raja, a graduate of Mt. Holyoke College in International Relations, is an advocate for gender equality in Pakistan. She is an active member of the local chapter of GirlsatDhabas. A sucker for everything wooly and warm, especially when its free, Mehrbano can be reached at mehrbanoraja@gmail.com.